We supply closed-loop AO systems based on Micromachined Membrane Deformable Mirrors (MMDM) with up to 79 channels and Piezoelectric Deformable Mirrors (PDM) with 19, 37, 79 and 109 channels. Aberration correction is possible in circular, rectangular, annular, elliptic and annular elliptic apertures. The feedback frame rates of 30 ... 1500 fps, depending on the camera and computer used, are sufficient for correction of aberrations caused by the atmospheric turbulence. Real-time AO phase control is realized by our FrontSurfer Hartmann-Shack WF sensor, offering a wide variety of control options including SVD eigenmode analysis, mode filtering, operations with the background, etc . We can also supply deformable mirror systems with linear 19 and 38-ch MMDM and 20-ch PDM for ultrafast pulse shaping. These application-specific systems should be controlled by a customer-made feedback sensors and software. AO systems with PDM are based on our technology of piezoelectric deformable mirrors (PDM). These mirrors can compensate large optical aberrations in a frequency range up to 1 kHz. Currently we fabricate PDM with 18, 19, 37, 69, 79, and 109 channels with apertures of 30mm and 50mm. Since these mirrors can produce large local responses, they are efficient for the correction of aberrations of the human eye, laser systems, and other demanding applications. Complete systems are always tailored to the needs of the customer. A basic system would include a deformable mirror, one or more HV amplifier units, USB, Ethernet, or PCI DAC controllers, a wavefront sensor, and a control computer running FrontSurfer WF reconstruction and contrrol software. AO systems with MMDM are based on our technology of Micromacined Membrane Deformable Mirrors. These mirrors are inexpensive and fast. They feature zero hysteresis and can work in a frequency range of up to 1kHz. Currently we fabricate 15mm MMDM with 17, 19, and 37 channels, 30mm MMDM with 39, 59, and 79 channels, 40mm MMDM with 59 and 79 channels, and 50mm MMDM with 79 channels. Parameters of these mirrors are naturally matched to the parameters of atmospheric turbulence, therefore they produce best results when used for correction of turbulence. Complete systems are always tailored to the needs of the customer. A basic system would include a deformable mirror, one or more HV amplifier units, USB, Ethernet, or PCI DAC controllers, a wavefront sensor, and a control computer running FrontSurfer WF reconstruction and control software. Jacopo Antonello, Tim Werkhoven, Michel Verhaegen, Hoa H Truong, Christoph U Keller and Hans C Gerritsen. Optimization-based wavefront sensorless adaptive optics for multiphoton microscopy. J. Opt. Soc. Am. A31(6):1337–1347, June 2014. Optical aberrations have detrimental effects in multiphoton microscopy. These effects can be curtailed by implementing model-based wavefront sensorless adaptive optics, which only requires the addition of a wavefront shaping device, such as a deformable mirror (DM) to an existing microscope. The aberration correction is achieved by maximizing a suitable image quality metric. We implement a model-based aberration correction algorithm in a second-harmonic microscope. The tip, tilt, and defocus aberrations are removed from the basis functions used for the control of the DM, as these aberrations induce distortions in the acquired images. We compute the parameters of a quadratic polynomial that is used to model the image quality metric directly from experimental input–output measurements. Finally, we apply the aberration correction by maximizing the image quality metric using the least-squares estimate of the unknown aberration. The authors have used a 17-ch MMDM with tip-tilt stage (MMDM15-17TT). T I M Werkhoven, J Antonello, H H Truong, M Verhaegen, H C Gerritsen and C U Keller. Snapshot coherence-gated direct wavefront sensing for multi-photon microscopy. Opt. Express 22(8):9715–9733, April 2014. Deep imaging in turbid media such as biological tissue is challenging due to scattering and optical aberrations. Adaptive optics has the potential to compensate the tissue aberrations. We present a wavefront sensing scheme for multi-photon scanning microscopes using the pulsed, near-infrared light reflected back from the sample utilising coherence gating and a confocal pinhole to isolate the light from a layer of interest. Juergen Czarske, Christoph Leithold, Nektarios Koukourakis, Lars Büttner, Moritz Stürmer and Ulrike Wallrabe. Novel adaptive laser measurement techniques. SPIE Newsroom, 2014. The authors used a deformable mirror (MMDM15-17TT) to overcome a shortcoming of existing laser interferometers in fluid dynamics applications..
Lars Büttner, Christoph Leithold and Jürgen Czarske. Advancement of an Interferometric Flow Velocity Measurement Technique by Adaptive Optics. International Journal of Optomechatronics 8(1):1-13, 2014. The authors present interferometric flow velocity measurements through a fluctuating air-water interface by the use of adaptive optics. Using the adaptive optics, the rate of valid measurement signals can be improved from 28% to 83%. The results are promising to enable measurements in difficult environments affected by refractive index variations which were not accessible so far. MMDM15-17TT has been used. Interferometric velocity measurements through a fluctuating gas-liquid interface employing adaptive optics.Opt. Express 21(25):30653–30663, December 2013. Optical transmission through fluctuating interfaces of mediums with different refractive indexes is limited by the occurring distortions. Temporal fluctuations of such distortions deteriorate optical measurements. In order to overcome this shortcoming we propose the use of adaptive optics. For the first time, an interferometric velocity measurement technique with embedded adaptive optics is presented for flow velocity measurements through a fluctuating air-water interface. A low order distortion correction technique using a fast deformable mirror (MMDM15-17TT) and a Hartmann-Shack sensor (based on piA640-210gm) with high frame rate is employed. The obtained high control bandwidth enables precise measurements also at fast fluctuating media interfaces. This methodology paves the way for several kinds of optical flow measurements in various complex environments..
M Loktev, G Vdovin, O Soloviev, S Kryukov and S Savenko. Adaptive optics combined with computer post-processing for horizontal turbulent imaging. In Real-Time Image and Video Processing 8437. 2012, 84370Y-84370Y-9. We describe an approach that offers an almost real time image enhancement through turbulent and wavy media. The approach consists in a combination of optimization-based adaptive optics with digital multi-frame post-processing. Applications in astronomical and terrestrial imaging, where the image features are initially unresolved due to loss of contrast, blur, vibrations and image wander have been illustrated by experimental results. A new software from Flexible Optical BV is presented..
Eric S Have and Gleb Vdovin. Physical and mechanical properties of a TIR-based liquid micro deformable mirror. In Micro-Optics 8428. 2012, 84281W-84281W-11. A deformable mirror based on the principle of total internal reflection (TIR) of light from an electrostatically deformed liquid-air interface was realized and used to perform closed-loop adaptive optical correction on a collimated laser beam aberrated by a rotating phase disk. The liquid system was characterized including open- and closed-loop frequency responses, determination of rise-times, the damping times of the liquid, and the influence of liquid surface motion in the absence of external optical aberrations. The dynamic behavior of the liquid was found to be dominated by gravity waves and the results of the experimental realization were in good agreement with the predictions of the theory. A miniaturization of the system promises to eliminate the dominant gravity waves and considerably reduce the errors introduced by ambient vibrations. Here we explore the possibilities of such a micro mirror and establish the boundary conditions and requirements for its realization..
Saisai Niu, Jianxin Shen, Chun Liang, Yunhai Zhang and Bangming Li. High-resolution retinal imaging with micro adaptive optics system. Appl. Opt. 50(22):4365–4375, August 2011. The authors describe a retinal imaging system based on 37-channel MMDM and Shack-Hartmann wavefront sensor from OKO Technologies..
Mikhail Loktev, Oleg Soloviev, Svyatoslav Savenko and Gleb Vdovin. Speckle imaging through turbulent atmosphere based on adaptable pupil segmentation. Opt. Lett.36(14):2656–2658, July 2011. We report on the first results to our knowledge obtained with adaptable multiaperture imaging through turbulence on a horizontal atmospheric path. We show that the resolution can be improved by adaptively matching the size of the subaperture to the characteristic size of the turbulence. Further improvement is achieved by the deconvolution of a number of subimages registered simultaneously through multiple subapertures. Different implementations of multiaperture geometry, including pupil multiplication, pupil image sampling, and a plenoptic telescope, are considered. Resolution improvement has been demonstrated on a ~550 m horizontal turbulent path, using a combination of aperture sampling, speckle image processing, and, optionally, frame selection..
Favio Bortoletto, Carlotta Bonoli, Paolo Panizzolo, Catalin D Ciubotaru and Fabio Mammano. Multiphoton Fluorescence Microscopy with GRIN Objective Aberration Correction by Low Order Adaptive Optics. PLoS ONE 6(7):e22321, July 2011. The authors describe a multiphoton confocal fluorescence imaging system equipped with a compact objective that incorporates a GRIN probe and requires no adjustment mechanisms. They minimized the effects of aberrations with optical compensation provided by a 15-mm 37-channel MMDM from Flexible Optical BV inserted in the optical path of the confocal architecture, resulting in greatly enhanced image quality..
Gleb Vdovin, Oleg Soloviev, Mikhail Loktev and Slava Savenko. Imaging through turbulence with temporally and spatially multiplexed systems. In Optics in Atmospheric Propagation and Adaptive Systems XIV 8178. 2011, 81780F-81780F-8. Based on the analysis of factors that influence atmospheric imaging over long turbulent horizontal paths, we consider a number of practical configurations of opto-electronic surveillance systems with optimized performance. Our approach is based on simultaneous quasi real-time processing of a number of images obtained through uncorrelated atmospheric paths, using either temporal or spatial multiplexing. Practical results obtained on a 4.25 km imaging path using newly developed imaging system, based on temporal multiplexing, combined with image restoration based on projection on convex sets, are reported. Potential applications include optical and IR long-range security and military surveillance, unmanned aircraft imaging systems and naval optical imaging and warning systems..
Gleb Vdovin, Oleg Soloviev, Mikhail Loktev, Slava Savenko and Lukasz Dziechciarczyk. Optimal correction and feedforward control of low-order aberrations with piezoelectric and membrane deformable mirrors. In Unconventional Imaging, Wavefront Sensing, and Adaptive Coded Aperture Imaging and Non-Imaging Sensor Systems 8165. 2011, 81650W-81650W-10. By analysis of the mechanical equations, describing deformable mirrors, we show that the print-through is the natural property of a deformable mirror, which is completely defined by the geometry and mechanics of deformation. The print-through causes increased scattering in imaging applications, and can result in hot/cold spots in laser applications. Further development of adaptive optics for extreme UV applications would also require to address the print-through problem. We describe different ways to reduce, or completely eliminate the print-through in continuous faceplate and membrane deformable mirrors. In combination with simple hysteresis compensation, our approach allows for high-precision feedforward control of these deformable mirrors, directly in terms of Zernike modes..
Kotaro Okamura and Takayoshi Kobayashi. Octave-spanning carrier-envelope phase stabilized visible pulse with sub-3-fs pulse duration. Opt. Lett.36(2):226–228, January 2011. The visible second harmonic of the idler output from a noncollinear optical parametric amplifier was compressed using adaptive dispersion control with a linear deformable mirror from Flexible Optical B.V. The amplifier was pumped by and seeded in the signal path by a common 400nm second-harmonic pulse from a Ti:sapphire regenerative amplifier. Thus, both the idler output and the second harmonic of the idler were passively carrier-envelope phase stabilized. The shortest pulse duration achieved was below 3fs..
M Loktev, G Vdovin, O Soloviev and S Savenko. Experiments on speckle imaging using projection methods. In Unconventional Imaging, Wavefront Sensing, and Adaptive Coded Aperture Imaging and Non-Imaging Sensor Systems 8165. 2011, 81650M-81650M-10. We present some experimental results of speckle imaging for near-diffraction-limited observation of ground-based scenery and astronomical objects through atmospheric turbulence. The method of alternating projections onto convex sets is used for iterative reconstruction of the point-spread function (PSF), combined with Wiener filtering for deconvolution and several pre-processing techniques. A modification of the optical system with aperture segmentation is considered. The results of imaging on a horizontal path and astronomical imaging are reported and compared with time averaged and best frame images. Apparent image improvement is demonstrated in a field much wider than the isoplanatic patch size..
Dominik Walter, Helge Bürsing and Reinhard Ebert. Emission of spiral patterns from filaments in the infrared. Opt. Express 18(23):24258–24263, November 2010. The authors investigated the spectral and spatial properties of the supercontinuum emission of single filaments in air in the infrared (1.5 µm - 5.3 µm). The infrared emission of the filament was controlled by modulating the spatial phase of the femtosecond driver pulse with a deformable mirror. Filaments with a characteristic spiral emission pattern in the infrared were generated for a variety of different wavefront profiles of the femtosecond pulse. The properties of this novel class of emission were analyzed more closely. Further understanding of the corresponding emission dynamics of the filament will help to refine current models of filament propagation. The author have used 37-ch 30mm PDM from Flexible Optical B.V..
H Song, R Fraanje, G Schitter, H Kroese, G Vdovin and M Verhaegen. Model-based aberration correction in a closed-loop wavefront-sensor-less adaptive optics system. Opt. Express 18(23):24070–24084, November 2010. This paper presents an aberration correction approach for WFSless AO systems based on the model of the WFSless AO system and a small number of intensity measurements, where the model is identified from the input-output data of the WFSless AO system by black-box identification. This approach is validated in an experimental setup with 20 static aberrations having Kolmogorov spatial distributions. The setup uses 37-ch PDM from Flexible Optical B.V..
Xiaodong Tao, Hyungsuck Cho and Farrokh Janabi-Sharifi. Optical design of a variable view imaging system with the combination of a telecentric scanner and double wedge prisms. Appl. Opt. 49(2):239–246, January 2010. Recent developments in micro-electro-mechanical systems and biotechnology have presented an emerging need for observation of dynamic targets in three-dimensional space. Unfortunately, conventional microscopes with fixed optical parameters have difficulty supplying sufficient vision information because of occlusion, small field of view, and low depth resolution. This paper introduces the design of a variable view imaging system that can supply a flexible view with a relatively large zenith angle and simple kinematics. Because of several performance factors, a multiobjective optimization process is applied to achieve an appropriate design. A prototype system is developed and used to verify the proposed design. The authors have used 37-ch "OKO" deformable mirror..
C M S Corley, Masaki Nagashima and B N Agrawal. Beam control and a new laboratory testbed for adaptive optics in a maritime environment. In Aerospace Conference, 2010 IEEE. 2010, 1-13. The Naval Postgraduate School is developing a laboratory environment for testing advanced beam control methods for compensation of atmospheric turbulence in adaptive optics for use in a maritime environment. This paper presents a multichannel transverse adaptive filter for beam control. Adaptive filters are useful for such control due to the constantly changing nature of atmospheric turbulence. A multichannel filter is required due to the multiple deformable mirror input commands and wavefront sensor output measurements in the system. The authors have used 59-ch MMDM from Flexible Optical B.V..
Sem Sem Chin, Karen M Hampson and Edward A H Mallen. Effect of correction of ocular aberration dynamics on the accommodation response to a sinusoidally moving stimulus. Opt. Lett. 34(21):3274–3276, November 2009. The authors used an adaptive optics system to correct the aberration dynamics of five subjects while they fixated on a monochromatic stimulus undergoing sinusoidal vergence changes between 1.5 and 2.5 D, at a temporal frequency of 0.2 Hz. The aberrations were measured at 20 Hz using a Shack-Hartmann sensor and corrected using a 37-actuator deformable mirror. The accommodation response (AR) was analyzed in terms of the gain and phase lag. Manipulation of aberrations significantly affected the gain of the AR for only one subject when the odd-order aberrations were corrected. The predictability of the sinusoidal stimulus could account for the lack of an effect in the remaining subjects and conditions. A 37-actuator piezoelectric deformable mirror from Flexible Optical B.V. was used to manipulate the aberrations in real time..
Karen M Hampson, Sem Sem Chin and Edward A Mallen. Dual wavefront sensing channel monocular adaptive optics system for accommodation studies. Opt. Express 17(20):18229–18240, September 2009. The authors present an adaptive optics system for investigation of the impact of the eye's aberrations on the dynamic accommodation response. The system uses a 37-channel piezoelectric deformable mirror from Flexible Optical..
Jörgen Thaung, Per Knutsson, Zoran Popovic and Mette Owner-Petersen. Dual-conjugate adaptive optics for wide-field high-resolution retinal imaging. Opt. Express 17(6):4454–4467, March 2009. The authors present analysis and preliminary laboratory testing of a realtime dual-conjugate adaptive optics instrument for ophthalmology that will enable wide-field high resolution imaging of the retina in vivo. The setup uses two deformable mirrors from Flexible Optical, one conjugate to the pupil and one conjugate to a plane close to the retina..
Yanan Huang, Jingfang Wan, Ming-Chieh Cheng, Zhipeng Zhang, Sissy M Jhiang and Chia-Hsiang Menq. Three-axis rapid steering of optically propelled micro/nanoparticles. Review of Scientific Instruments80(6):063107, 2009. The authors present the design and implementation of a three-axis steering system, wherein a micro/nanoparticle is optically trapped and propelled to serve as a measurement probe. The system uses a 10-mm deformable mirror from Flexible Optical as an actuator for axial steering..
Gleb Vdovin, Oleg Soloviev, Alexander Samokhin and Mikhail Loktev. Correction of low order aberrations using continuous deformable mirrors. Opt. Express 16(5):2859–2866, March 2008. The authors show that to achieve a high quality correction of low-order aberrations using membrane, bimorph and continuous facesheet mirrors, these mirrors should have sufficient number of actuators positioned outside the correction aperture..
A J Wright, S P Poland, J M Girkin, C W Freudiger, C L Evans and X S Xie. Adaptive optics for enhanced signal in CARS microscopy. Opt. Express 15(26):18209–18219, December 2007. The authors report the use of adaptive optics with coherent anti-Stokes Raman scattering (CARS) microscopy for label-free deep tissue imaging based on molecular vibrational spectroscopy. The setup employs the 15-mm 37-channel deformable membrane mirror and a random search optimization algorithm to improve signal intensity and image quality at large sample depths. The authors demonstrate the ability to correct for both system and sample-induced aberrations in test samples as well as in muscle tissue in order to enhance the CARS signal. The combined system and sample-induced aberration correction increased the signal by an average factor of ~3x for the test samples at a depth of 700 µm and ~6x for muscle tissue at a depth of 260 µm. The enhanced signal and higher penetration depth offered by adaptive optics will augment CARS microscopy as an in vivo and in situ biomedical imaging modality..
Mikhail Loktev, Gleb Vdovin, Nikolai Klimov and Svetlana Kotova. Liquid crystal wavefront corrector with modal response based on spreading of the electric field in a dielectric material. Opt. Express 15(6):2770–2778, March 2007. A novel liquid crystal (LC) wavefront corrector with smooth modal influence functions is proposed and realized. The modal character of the response is determined by spreading of the electric field in a thick ceramic substrate. The device implemented is operating in a reflective (mirror) mode; however, similar principles can be used to build a transmissive device..
N A Klimov, S P Kotova, S A Samagin, Yu M Kvashnin, G V Vdovin and Yu M Loktev. Modal liquid-crystal wavefront corrector on a ceramic substrate: the single-contact approximation. Quantum Electronics 37(12):1169, 2007. The possibility of manufacturing a multichannel modal liquid-crystal corrector of a new type based on a ceramic substrate with a high permittivity is confirmed theoretically and experimentally. A mathematical model of the single-electrode corrector is proposed and used to study the dependences of the voltage and phase profiles on the properties of the corrector design. The technology of manufacturing a ceramic substrate with built-in electrodes is developed..
S Campbell, S M F Triphan, R El-Agmy, A H Greenaway and D T Reid. Direct optimization of femtosecond laser ablation using adaptive wavefront shaping. Journal of Optics A: Pure and Applied Optics 9(11):1100, 2007. The authors introduce an approach based on using an iterative simulated annealing algorithm to drive the outcome of femtosecond laser ablation towards a specific target shape by using a two-dimensional deformable mirror by Flexible Optical B.V. Unlike previous work combining adaptive optics and laser machining the authors use the machining outcome itself as the fitness parameter for the optimization procedure. Single-pulse ablation features with programmable aspect ratios and dimensions as small as 2.5 µm are faithfully reproduced by the technique in a chromium-on-glass test sample..
David Merino, Chris Dainty, Adrian Bradu and Adrian Gh. Podoleanu. Adaptive optics enhanced simultaneous en-face optical coherence tomography and scanning laser ophthalmoscopy. Opt. Express 14(8):3345–3353, April 2006. A novel combination of adaptive optics with a simultaneous en-face OCT/SLO system for high resolution imaging of the in-vivo human retina is presented. The adaptive optics closed loop system uses a 37 actuator OKO membrane deformable mirror..
Amanda J Wright, Brett A Patterson, Simon P Poland, John M Girkin, Graham M Gibson and Miles J Padgett. Dynamic closed-loop system for focus tracking using a spatial light modulator and a deformable membrane mirror. Opt. Express 14(1):222–228, January 2006. A dynamic closed-loop method for focus tracking using a spatial light modulator and a deformable membrane mirror within a confocal microscope is described. A 37-channel micromachined membrane deformable mirror from OKO Technologies is used..
Markus Rueckel, Julia A Mack-Bucher and Winfried Denk. Adaptive wavefront correction in two-photon microscopy using coherence-gated wavefront sensing.Proceedings of the National Academy of Sciences 103(46):17137-17142, 2006. The authors demonstrate that resolution and signal size in two-photon microscopy can be substantially improved, even in living biological specimens, by adaptive wavefront correction based on sensing the wavefront of coherence-gated back-scattered light (coherence-gated wavefront sensing, CGWS) and wavefront control by a deformable mirror. A nearly diffraction-limited focus can be restored even for strong aberrations. CGWS-based wavefront correction should be applicable to samples with a wide range of scattering properties and it should be possible to perform real-time pixel-by-pixel correction even at fast scan speeds. The adaptive optics closed loop system uses a 37 actuator OKO membrane deformable mirror..
Stéphane R Chamot, Chris Dainty and Simone Esposito. Adaptive optics for ophthalmic applications using a pyramid wavefront sensor. Opt. Express 14(2):518–526, January 2006. The authors present a new adaptive optics system for the eye using a pyramid wavefront sensor interfaced in closed-loop with a 19-channel piezoelectric deformable mirror from OKO Technologies..
Oleg Soloviev and Gleb Vdovin. Hartmann-Shack test with random masks for modal wavefront reconstruction. Opt. Express 13(23):9570–9584, November 2005. The paper discusses the influence of the geometry of a Hartmann-(Shack) wavefront sensor on the total error of modal wavefront reconstruction..
R El-Agmy, H Bulte, A H Greenaway and D Reid. Adaptive beam profile control using a simulated annealing algorithm. Opt. Express 13(16):6085–6091, August 2005. The authors present a programmable beam-shaping method based on the combination of a deformable mirror and a simulated annealing algorithm. 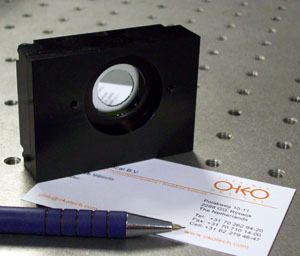 A 37-channel micromachined membrane deformable mirror from OKO Technologies is used. The experimental results show that the system is capable of adaptively creating, on demand, Gaussian and super-Gaussian beam profiles that closely match the desired target parameters..
Eugenie Dalimier and Chris Dainty. Comparative analysis of deformable mirrors for ocular adaptive optics. Opt. Express 13(11):4275–4285, May 2005. The authors have evaluated the ability of three commercially available deformable mirrors to compensate the aberrations of the eye. The mirrors evaluated were a 37 actuator membrane mirror and 19 actuator piezo mirror (OKO Technologies) and a 35 actuator bimorph mirror (AOptix Inc)..
G Vdovin, M Loktev, A Simonov, V Kijko and S Volkov. Adaptive correction of human-eye aberrations in a subjective feedback loop. Opt. Lett. 30(7):795–797, April 2005. An adaptive optical system with a subjective feedback loop is used to improve the visual acuity and to determine the aberrations of the human eye. The system is based on a 19-channel piezoelectric deformable mirror from OKO Technologies..
Modal wavefront correctors based on nematic liquid crystals. TU Delft, 2005. The thesis is dedicated to investigation and development of modal wavefront correctors based on nematic liquid crystals, including liquid crystal adaptive lenses and multi-element wavefront correctors. The technology is avaliable in OKO Technologies. A free printed copy of the thesis is available by request..
Jesus Garduño-Mejía, Alan H Greenaway and Derryck T Reid. Programmable spectral phase control of femtosecond pulses by use of adaptive optics and real-time pulse measurement. J. Opt. Soc. Am. B 21(4):833–843, April 2004. The authors describe a programmable spectral-phase, pulse-shaping system for femtosecond pulses based on the 19-channel linear deformable mirror from OKO Technologies. Accurate spectral phase design as well as pulse intensity modulation was achieved with direct control of the mirror surface by use of a negative-feedback, mirror-surface control mode. Convergence to the chosen spectral-phase design was typically achieved within several seconds..
Eirini Theofanidou, Laurence Wilson, William J Hossack and Jochen Arlt. Spherical aberration correction for optical tweezers. Optics Communications 236(1–3):145 - 150, 2004. In typical optical tweezers experiments the quality of the trap deteriorates due to optical aberrations caused by the refractive index mismatch at the glass–water interface when trapping deep inside a sample or out of the imaging plane. The authors correct these aberrations using a 37-channel micromachined membrane deformable mirror from OKO Technologies..
J Garduño-Mejía, A Greenaway and D Reid. Designer femtosecond pulses using adaptive optics. Opt. Express 11(17):2030–2040, August 2003. The authors describe a femtosecond pulse shaper using a linear micromachined membrane deformable mirror from OKO Technologies..
Enrique Fernandez and Pablo Artal. Membrane deformable mirror for adaptive optics: performance limits in visual optics. Opt. Express11(9):1056–1069, May 2003. The performance of a membrane deformable mirror with 37 electrodes (OKO Technologies) is studied in order to characterize its utility as an adaptive optics element..
Gleb Vdovin, Mikhail Loktev and Alexander Naumov. On the possibility of intraocular adaptive optics. Opt. Express 11(7):810–817, April 2003. Authors consider the technical possibility of an adaptive contact lens and an adaptive eye lens implant based on the modal liquid crystal wavefront corrector, aimed to correct the accommodation loss and higher-order aberrations of the human eye. 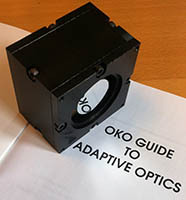 The demonstrator is based on a liquid crystal adaptive lens, which is available from OKO Technologies..
Christoph U Keller, Claude Plymate and S M Ammons. Low-cost solar adaptive optics in the infrared. In Innovative Telescopes and Instrumentation for Solar Astrophysics 4853. 2003, 351-359. 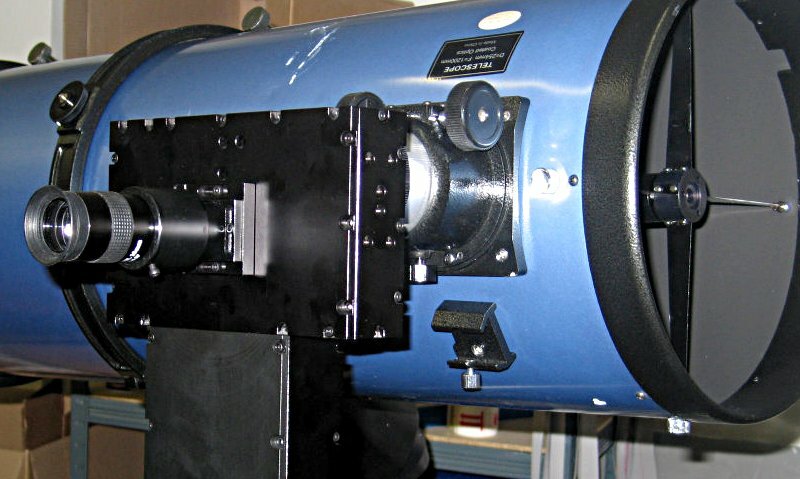 The authors have developed a low-cost adaptive optics system for solar observations in the infrared. 37-ch 15-mm OKO mirror is used..
D ~C ~L Cheung, T ~H Barnes and T ~G Haskell. Feedback interferometry with membrane mirror for adaptive optics. Optics Communications 218:33-41, 2003. Feedback interferometers can be used for many optical measurements as well as aberration correction. The choice of the phase modulator in the interferometer has major influence on the operation of the feedback system. Conventional wisdom is that independent actuator movement is a basic requirement for the modulator in order to allow the feedback system to operate in stable fashion and that membrane mirrors are not suitable. We demonstrate the operation of a feedback interferometer which uses a membrane mirror as the phase modulator. We show that even with the strong coupling introduced by the influence function of the membrane mirror, the feedback system can still operate normally. Our interferometer is based on a radial shearing polarizing Sagnac interferometer. The current system is able to correct static aberration with significant improvement on Strehl ratio..
S Kotova, M Kvashnin, M Rakhmatulin, O Zayakin, I Guralnik, N Klimov, P Clark, Gordon Love, A Naumov, C Saunter, M Loktev, G Vdovin and L Toporkova. Modal liquid crystal wavefront corrector. Opt. Express 10(22):1258–1272, November 2002. Results are presented of the properties of a liquid crystal wavefront corrector for adaptive optics. The technology is avaliable in OKO Technologies by request..
Walter Lubeigt, Gareth Valentine, John Girkin, Erwin Bente and David Burns. Active transverse mode control and optimization of an all-solid-state laser using an intracavity adaptive-optic mirror. Opt. Express 10(13):550–555, July 2002. 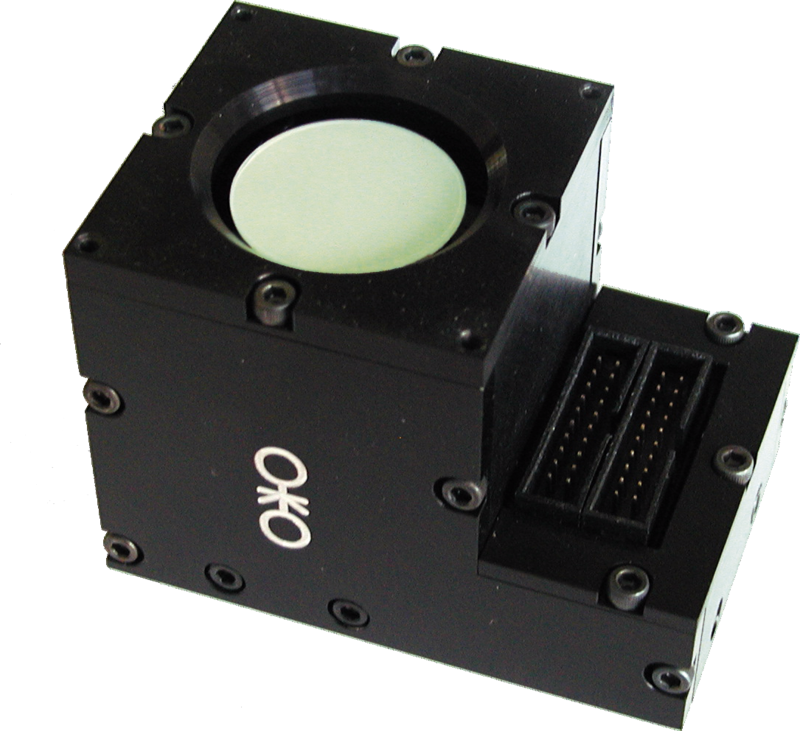 A 37 element adaptive optic mirror from OKO Technologies has been used intracavity to control the oscillation mode profile of a diode-laser pumped Nd:YVO4 laser. Mode and power optimisation are demonstrated by closed loop automatic optimisation of the deformable mirror..
Gleb Vdovin and Mikhail Loktev. Deformable mirror with thermal actuators. Opt. Lett. 27(9):677–679, May 2002. A novel type of ultralow-cost deformable mirror with thermal actuators is reported. The mirror is available from OKO Technologies..
Three-dimensional virtual retinal display using a deformable membrane mirror. University of Washington, 2002. A deformable membrane mirror from OKO Technologies is being used to generate multiple focal planes within a scanned light display, or virtual retinal display (VRD)..
Sarah C McQuaide, Eric J Seibel, Robert Burstein and Thomas A Furness. Three-dimensional Virtual Retinal Display System using a Deformable Membrane Mirror. SID Symposium Digest of Technical Papers 33(1):1324–1327, 2002. Michael R Armstrong, Peter Plachta, Evgueni A Ponomarev and R J D Miller. Versatile 7-fs optical parametric pulse generation and compression by use of adaptive optics. Opt. Lett.26(15):1152–1154, August 2001. Authors have compressed the output from a b-barium borate noncollinear optical parametric amplifier to ~7-fs pulse durations, using a micromachined deformable mirror (from OKO Technologies) with an efficient search algorithm..
Gleb Vdovin and Vadim Kiyko. Intracavity control of a 200-W continuous-wave Nd:YAG laser by a micromachined deformable mirror. Opt. Lett. 26(11):798–800, June 2001. A silicon micromachined membrane deformable mirror with a diameter of 10 mm, reflectivity of better than 99.8%, and a surface deflection range of 3 mm has been used for intracavity control of an industrial 200-W cw Nd:YAG laser..
Robert K Tyson and Benjamin West Frazier. Microelectromechanical System Programmable Aberration Generator for Adaptive Optics. Appl. Opt.40(13):2063–2067, May 2001. A 37-actuator micromachined membrane deformable mirror from OKO Technologies was used as a programmable aberration generator..
Enrique J Fernández, Ignacio Iglesias and Pablo Artal. Closed-loop adaptive optics in the human eye. Opt. Lett. 26(10):746–748, May 2001. Authors demonstrated real-time closed-loop correction of aberrations in the living eye. Defocus is removed by a motorized optometer, and higher-order aberrations are corrected by a membrane deformable mirror from OKO Technologies..
Mikhail Loktev, Davies William De Lima Monteiro and Gleb Vdovin. Comparison study of the performance of piston, thin plate and membrane mirrors for correction of turbulence-induced phase distortions. Optics Communications 192(1–2):91 - 99, 2001. In the framework of the Kolmogorov turbulence model and analytical and numerical models of deformable mirrors, the authors investigated and intercompared the correction performances of piston, membrane and flexible faceplate (with either free edge, supported edge or clamped edge) adaptive mirrors featuring orthogonal, hexagonal and segmented ring actuator structures..
Harold Dyson, Ray Sharples, N Dipper and Gleb Vdovin. Cryogenic wavefront correction using membrane deformable mirrors. Opt. Express 8(1):17–26, January 2001. Micro-machined membrane deformable mirrors (MMDMs) are being evaluated for their suitability as wavefront correctors at cryogenic temperatures. Presented here are experimental results for the change in the initial mirror figure of 37-channel MMDMs from OKO Technologies upon cooling to T=78K. The changes in the influence functions are also explored. Of the sample of 3 mirrors tested, one was found to have sufficiently small initial static aberrations to be useful as a wavefront corrector at this temperature. The influence functions at T=78K were found to be similar in shape to both those at room temperature and theoretical predictions of the MMDMs surface shape. The magnitude of the surface deflection at T=78K was reduced by around 20% compared with room temperature values..
C Paterson and J C Dainty. Hybrid curvature and gradient wave-front sensor. Opt. Lett. 25(23):1687–1689, December 2000. Authors proposed a new wave-front sensor for adaptive optics that gives signals for the curvature and the two gradient components of the wave front simultaneously. The performance of such a sensor used in conjunction with a micromachined membrane deformable mirror (from OKO Technologies) is considered..
E Zeek, R Bartels, M M Murnane, H C Kapteyn, S Backus and G Vdovin. Adaptive pulse compression for transform-limited 15-fs high-energy pulse generation. Opt. Lett. 25(8):587–589, April 2000. Authors demonstrate the use of a pulse shaper based on OKO's micromachined membrane deformable mirror to correct high-order residual phase aberrations in a 1-mJ, 1-kHz, 15-fs laser amplif ier..
Carl Paterson, I Munro and J Dainty. A low cost adaptive optics system using a membrane mirror. Opt. Express 6(9):175–185, April 2000. A low cost adaptive optics system is presented. The system uses a 37 actuator membrane mirror (from OKO Technologies) and operates at frame rates up to 800 Hz using a single processor..
Yu. M Loktev, V N Belopukhov, F L Vladimirov, G V Vdovin, G D Love and A F Naumov. Wave front control systems based on modal liquid crystal lenses. Review of Scientific Instruments71(9):3290-3297, 2000. Authors describe electro-optical systems for adaptive focusing of linearly polarized light. The systems are based on liquid crystal adaptive lenses, which are commercially available from OKO Technologies..
R Bartels, S Backus, E Zeek, L Misoguti, G Vdovin, I P Christov, M M Murnane and H C Kapteyn. Shaped-pulse optimization of coherent emission of high-harmonic soft X-rays. Nature 406(6792):164-166, 2000. The technique of pulse compression was applied to generation of coherent soft X-ray beams. The pulse-shaping apparatus was based on a micromachined deformable mirror from OKO Technologies..
O Albert, L Sherman, G Mourou, T B Norris and G Vdovin. Smart microscope: an adaptive optics learning system for aberration correction in multiphoton confocal microscopy. Opt. Lett. 25(1):52–54, January 2000. Off-axis aberrations in a beam-scanning multiphoton confocal microscope are corrected with a deformable mirror from OKO Technologies..
Lijun Zhu, Pang-Chen Sun, Dirk-Uwe Bartsch, William R Freeman and Yeshaiahu Fainman. Wave-front generation of Zernike polynomial modes with a micromachined membrane deformable mirror.Appl. Opt. 38(28):6019–6026, October 1999. Authors investigate the characteristics of a 37-channel micromachined membrane deformable mirror (from OKO Technologies) for wave-front generation. They demonstrate wave-front generation of the first 20 Zernike polynomial modes..
Lijun Zhu, Pang-Chen Sun and Yeshaiahu Fainman. Aberration-Free Dynamic Focusing with a Multichannel Micromachined Membrane Deformable Mirror. Appl. Opt. 38(25):5350–5354, September 1999. Aberration-free dynamic focusing was demonstrated with a low-cost 19-channel micromachined membrane deformable mirror from OKO Technologies..
Erik Zeek, Kira Maginnis, Sterling Backus, Ulrich Russek, Margaret Murnane, Gérard Mourou, Henry Kapteyn and Gleb Vdovin. Pulse compression by use of deformable mirrors. Opt. Lett. 24(7):493–495, April 1999. An electrostatically deformable, gold-coated, silicon nitride membrane mirror was used as a phase modulator to compress pulses from 92 to 15 fs. Both an iterative genetic algorithm and single-step dispersion compensation based on frequency-resolved optical gating calibration of the mirror were used to compress pulses to within 10% of the transform limit. Frequency-resolved optical gating was used to characterize the pulses and to test the range of the deformable-mirror-based compressor..
Adaptive Control of a Micromachined Continuous-Membrane Deformable Mirror for Aberration Compensation. Appl. Opt. 38(1):168–176, January 1999. An adaptive experimental system to compensate for the wave-front aberrations of a model eye has been built in which a 19-channel micromachined deformable mirror from OKO Technologies was used..
Gleb V Vdovin, Nicolas Kugler and Martin Schacht. Membrane deformable mirrors under CW laser load. In Adaptive Optics Systems and Technology 3762. 1999, 58-66. Behavior of micromachined membrane deformable mirrors from OKO Technologies under continuous laser load has been investigated experimentally and theoretically..
Alexander F Naumov and Gleb Vdovin. Multichannel liquid-crystal-based wave-front corrector with modal influence functions. Opt. Lett.23(19):1550–1552, October 1998. Authors report on a multichannel liquid-crystal-based wave-front corrector with smooth modal influence functions. The technology is avaliable in OKO Technologies by request..
A F Naumov, Yu. M Loktev, I R Guralnik and G Vdovin. Liquid-crystal adaptive lenses with modal control. Opt. Lett. 23(13):992–994, July 1998. Authors report on a novel approach to the realization of nematic liquid-crystal (LC) cylindrical and spherical lenses. The lenses are available from OKO Technologies..
F Druon, G Cheraux, J Faure, J Nees, Maksimchuk A M. Nantel, G Mourou, J C Chanteloup and G Vdovin. Wave-frontcorrection of femtosecond terawatt lasers by deformable mirrors. Optics Letters 23:1043, 1998. Reconstruction of an object shape from the near-field intensity of areflected paraxial beam. Appl. Opt.36(22):5508–5513, August 1997. Experimental reconstruction of an object shape from the near-field intensity of reflected or transmitted light is reported. The method of reconstruction is based on the direct numerical solution of the finite difference representation of the paraxial irradiance-transport equation..
G V Vdovin, Simon Middelhoek and Pasqualina M Sarro. Technology and applications of micromachined silicon adaptive mirrors. Optical Engineering 36:1382, 1997. Gleb Vdovin and P M Sarro. Flexible mirror micromachined in silicon. Appl. Opt. 34(16):2968–2972, June 1995. 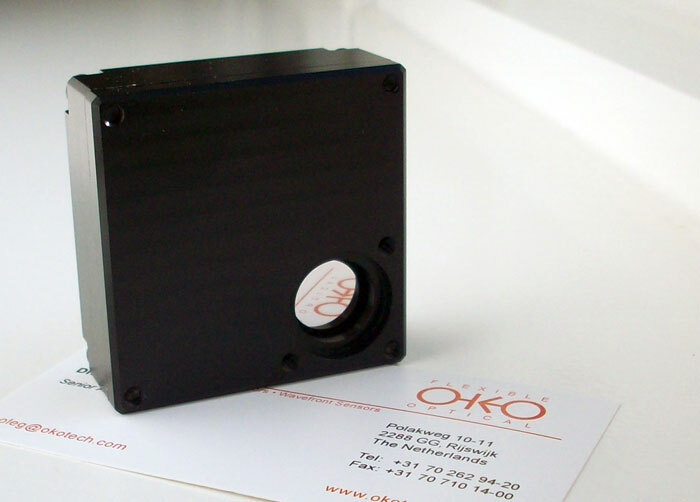 One of the first publications on the technology of micromachined membrane deformable mirrors (MMDMs)..
OKO Technologies produces low-cost piezoelectric deformable mirrors (PDM) with clear aperture of 30 mm and 50 mm, for laser and imaging applications. The full surface stroke is 6 μm standard, with maximum stroke between the adjacent actuators in the range 1 to 3 μm. 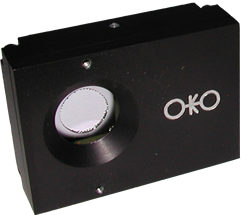 The DM is controlled by OKO HV amplifer(s) and interfaced to a PC using 8-bit PCI, 12-bit USB, or 16-bit Ethernet controller(s). The full-amplitude mechanical response of the mirror is faster than 150 microsecond, but usually the response time is limited to 0.5 ms by the control electronics. For high power laser applications, the surface can be coated with a broad range of HR metal and multilayer dielectric coatings. 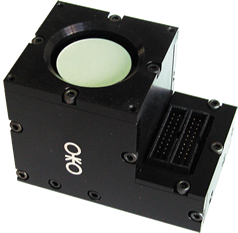 PDM easily integrates with OKO FrontSurferwavefront sensor into a complete closed-loop adaptive optical system running with frame frequency of 15 to 100 Hz. For direct laser beam optimization, the DM can be comnined with theBeamTuner optimization controller, consisting of optimization software and focal spot (brightness) sensor. Applications include dynamic correction of optical aberrations in high power laser, astronomical and imaging systems. Some of our standard MMDM are presented below. For a complete overview of our standard deformable mirrors, please refer to our Product Guide. To request a custom-designed MMDM, please contact us using the form on the left. 15-mm MMDM with 17 actuators and integrated tip-tilt stage has been specially designed for correction of low-order aberrrations. 15 mm 37-ch "OKO Mirror"
This is probably the most popular deformable mirror ever made. In production since 1997, hundreds of these devices are used by scientists and engineers in all kinds of adaptive optics project, including laser beam control, real time atmospheric correction, ophthalmology, intracavity laser control, communications, holographic memory, optical fiber switching, etc. Lenses with customized parameters are available by request. OKO Tech produces membrane and piezoelectric DM for ultrafast pulse control. These mirrors are usually used in a stretcher for selective control of the delays of chosen spectral components. The linear piezoelectric deformable mirror for femtosecond pulse shaping has 10x50mm active area, controlled by two rows of 10 actuators each. The actuator pitch is 5 mm. The maximum surface deflection is 6 um, the profile difference between the adjacent actuators can reach 3um. The initial figure is slightly spherical. The mirror can be custom coated with low-dispersion dielectrics and metal-dielectric coatings. Short (4.1MB) interferometric video of the moving mirror surface. The mirror can be supplied with a complete set of control electronics, including 20-ch 400 V amplifier unit and a 20 (40)-ch USB DAC unit (or a 24-ch 8-bit PCI DAC card) for interfacing to a PC. Full technical description can be downloaded here. The linear membrane DM represents an attractive alternative to LC wavefront correctors for femtosecond pulse compression and precise control and optimization of the temporal/spectral pulse parameters. They feature very low dispersion, negligible power consumption, high optical quality which is usually better than 2 fringes over the whole aperture, fast response and large correction range. These mirrors can be coated with high-reflective dielectric coatings to be used in lasers at power levels of up to 500W CW. Negligible hysteresis. The linear MMDM are available with 19 and 38 (2x19) actuator structures, with 11x39mm membrane. The fast steering platform PDM-2-TT can be used alone or in combination with some other deformable mirror for tip/tilt correction to archive better performance. It has deflection range of +/-1 mrad and useful frequency response of 300Hz. The device is controlled by applying analog voltages with maximum amplitude of 350V to its 3 piezoelectric actuators. We recommend our USB Tip/Tilt Control Unit for driving the device. The corrector is supplied without optical part but can accept any front surface mirror with diameter from 10 to 25 mm. Compact size (35x35x65 mm) of the unit allows the user to fit it into any optical setup. 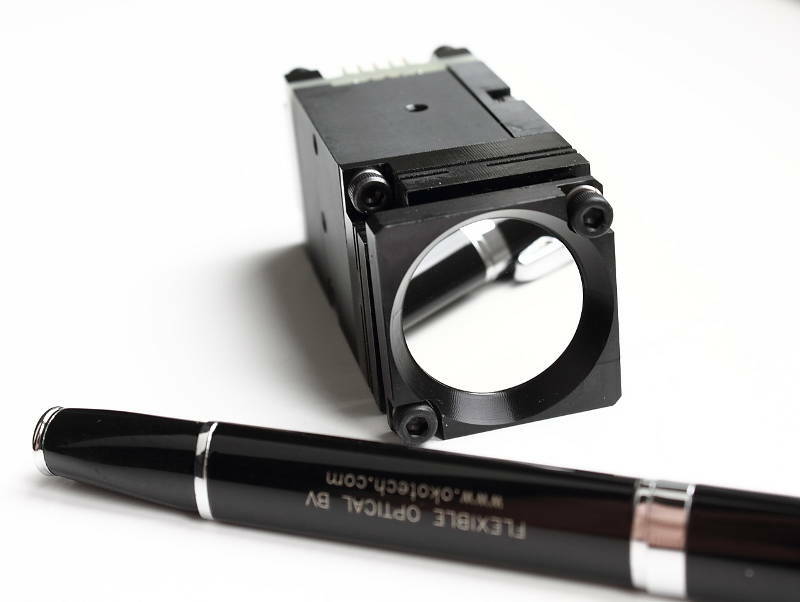 The low cost tip-tilt mirror is controled by 2 piezo actuators, providing +/- 2,6 mrad deflection range in x and y axes, with frequency up to 200 Hz (first resonance frequency at 300 Hz). The clear aperture of the mirror is 12.5 mm, the overal size of the device is 50 × 50 × 21 mm³. We recommend our USB Tip/Tilt Control Unit for driving the device. This extremly low cost tip-tilt mirror is controled by 2 mechanical actuators, driven by inductive coils, providing +/- 4,4 mrad deflection range in x and y axes, with smooth operational frequency up to 100 Hz (first resonance frequency at 240 Hz). The clear aperture of the mirror is 25.4 mm and the overal size of the device is 57 × 57 × 40 mm³. Each channel of the device can be controlled by an analog input of 0 to 5 Volts. For a digital control, we recommend our 4-channel USB DAC Unit.